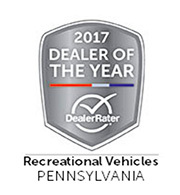 Souderton-based RV dealership, Fretz RV, has been chosen as 2016 and 2017 Dealer of the Year by review website DealerRater.com. Fretz RV is one of the largest RV dealers in Pennsylvania and serves customers in nearby states including New Jersey, Delaware, and New York. As an RV dealership that started out as a small country hardware store, Fretz RV has cultivated a reputation for not only top notch products but also prides itself on dedication to customer satisfaction. Steve Fretz, owner and operator of Fretz RV, explains, "Our goal is to make sure our customers are treated like family and leave here feeling great about their choice to buy from us." That sentiment was echoed by the many high reviews left for his dealership on DealerRater.com. DealerRater awards are given annually to the top dealerships across the US and Canada. They employ Bayesian algorithm, which takes into account the average star rating and total number of reviews from the past year. To be chosen as a winner means that location is being recognized for their outstanding customer service. DealerRater.com allows customers in the auto and related industries to share their experiences and leave detailed accounts with other interested buyers looking to make a purchase. There are over 2,000,000 reviews on the popular website with a reach of over 14,000,000 customers monthly. Each review left about a dealership is screened to make sure that a real consumer wrote it. We carry Jayco, Coachmen Galleria, Roadtrek, Pleasure Way, Crossroads Sunset Trail, Starcraft RV, Renegade Vienna, Winnebago, and more!